If you’re shopping for a beverage refrigerator, you might be overwhelmed by all of the brands, features, and capacities available to consumers. Thankfully, making your purchase doesn’t have to be difficult. 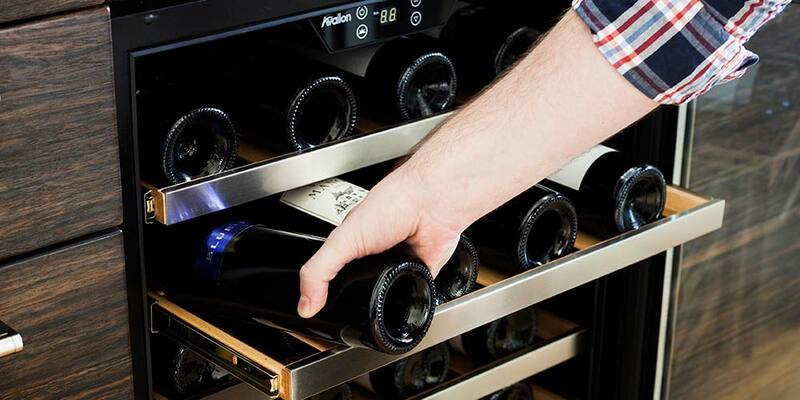 In fact, the vast array of options for drink cooling and storage can actually make it easier to find the right unit. It’s simply a matter of knowing exactly what will best suit your personal needs. Once you’ve decided which features are important to you, shopping for a beverage refrigerator becomes much simpler. Consider these useful tips to buying a beverage refrigerator for your home or office. First, determine what types of beverages you plan on storing. Will you be primarily storing canned products? 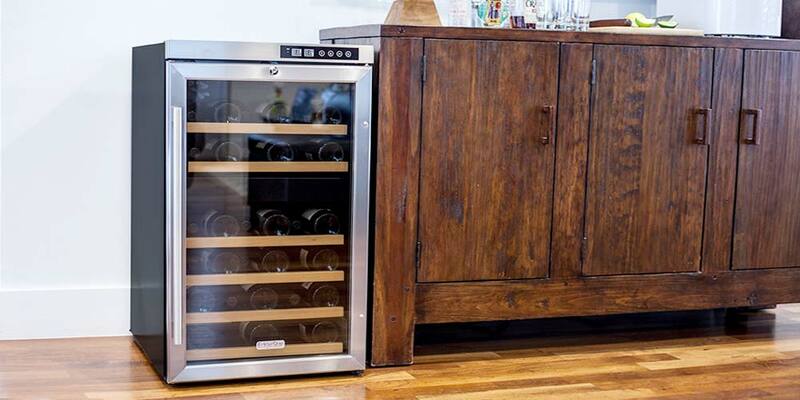 Or will you need an appliance that can hold bottles of wine in addition to soda, beer, or other drinks? Depending on your diet and preferences, you need to pick the right beverage cooler accordingly. Some models are designed to contain only cans, while dual-zone beverage coolers accommodate both wine and canned cold beverages. These coolers store each kind of drink in separate compartments inside. 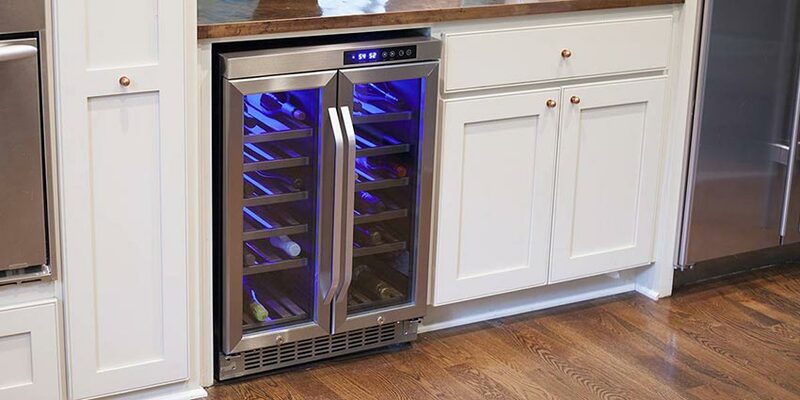 And, of course, there are also dedicated wine refrigerators if you are looking to solely store your wine collection in a temperature-controlled environment. Beverage centers come in a wide range of sizes. 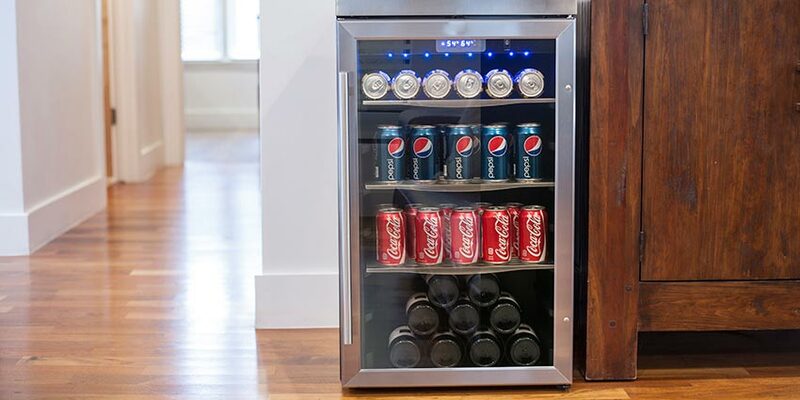 Most small-capacity beverage refrigerators will work for the average home or office. If you only plan on regularly keeping drinks for one or two people or restocking regularly, you can safely go with one that holds 60 cans or less. These units are also great for fitting in smaller office spaces or sitting out of the way on your counter. For a small family or group, a mid-capacity beverage refrigerator that stores between 80 to 100 cans is best. These units need more room to sit, but you can also install a built-in unit to save floor space if so desired. 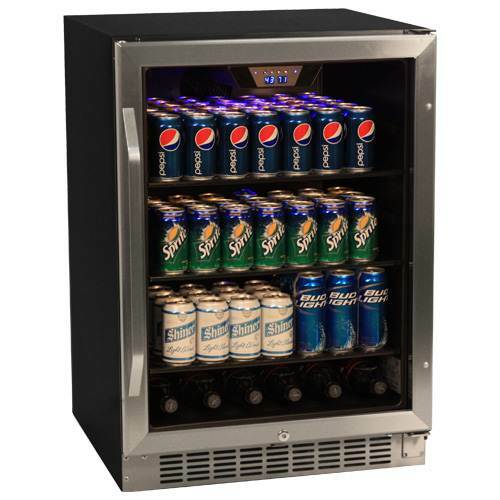 Finally, if you frequently entertain large groups of people or own a larger office, a large-capacity beverage refrigerator with a capacity of around 150 cans will enable you to keep several items cold at once and save you from running out of product. The available room in your home or office is also essential in deciding what beverage refrigerator to purchase. Typically, small to medium appliances can fit in tight spots, such as underneath tables or on countertops with limited surface area. Larger units can require more space, but the majority of these currently on the market can still work easily in your home or office. With some exceptions, bigger models stand anywhere between two and a half to three feet high. You’ll also want to determine whether the fridge will be housed indoors or outdoors. Outdoor models are generally sturdier, with their exteriors constructed from stainless steel. Some outdoor units also have doors with triple-pane glass. These are wonderful if you entertain guests outdoors and make wonderful additions to any patio, backyard, pool, or hot tub area. Finally, you’ll need to know whether you want a freestanding or built-in unit. Freestanding beverage refrigerators offer flexibility because they can be installed nearly any place with an electrical outlet. Built-in refrigerators are intended to be installed under already existing counters, which is helpful for space-challenged areas such as small kitchens or apartments. 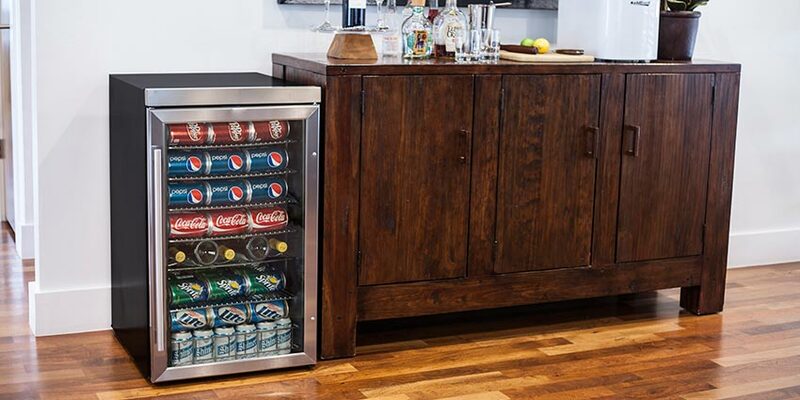 There are many energy-efficient beverage centers available for the discerning buyer. As you’re shopping, look for products that are Energy Star certified. Energy Star, a standard created in 1992 by the United States Environmental Protection Agency (EPA) and the Department of Energy, identifies and promotes energy-efficient appliances and electronic goods. Items displaying the Energy Star emblem typically use between 20% and 30% less energy than specified by government standards. Additionally, you may opt to compare the average energy use, displayed in kilowatt hours per year (kWh/yr), listed with each model. Machines with this feature have separate temperature zones in either side-by-side or top and bottom compartments. These are excellent for both storing wine and canned items, as wine is often chilled at higher temperatures than beer, soda, or other canned beverages. Refrigerators with a locking door are usually only opened with a key. This is useful for keeping minors away from alcohol or for preventing expensive items from disappearing. Digital readouts and easily-adjustable temperature settings help you store your products at the optimal temperature. Inside shelves are movable, allowing you to customize shelf height to better allow your liquids to fit. In these fridges, interior LED lighting proves to be more energy-efficient and longer-lasting than standard lighting. Units with this capability allow you to change the side on which the door is installed and opens. Prices on beverage refrigerators vary from inexpensive for basic models up to high-priced units that boast a plethora of features. Knowing what you need in a fridge, as well as researching features and costs, should help you determine a price range for your purchase. Usually, models appropriate for home or office use can cost anywhere from $170 to $1,800, with some premium items pricing between $3,000 and $4,000. Be sure to understand your needs and set a realistic budget before you begin shopping to avoid any unnecessary purchases. Avanti prides itself in innovation, providing appliances for home, commercial, and specialty use for nearly half a century. Danby is a family-owned business and market leader in North America, giving buyers plenty of affordable, versatile options in liquid storage. Edgestar specializes in functionality and portability, crafting sleekly designed beverage coolers at a wide assortment of price points. Summit is an industry leader in small and large appliances, offering durable beverage centers for both home and commercial use. U-Line is an award-winning company, manufacturing advanced refrigeration systems in the United States for over fifty years. Your investment in a beverage center is money well spent, affording you many years of convenience. These tips to buying a beverage refrigerator for your home kitchen or office should prove helpful as you shop around. Knowing what you need, what you want to spend, and information about popular brands gives you a guide to making an informed, wise purchasing decision. Hello, We are looking for a beverage refrigerator for an opening where a trash compactor was. Needs to be freestanding with adjustable legs, dual hinge adjustable shelves with led 33 1/2 height x 15 inches wide and no more than 23 inch deep. Stainless steel preferred. 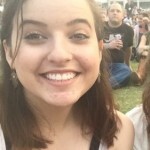 Can you recommend one? 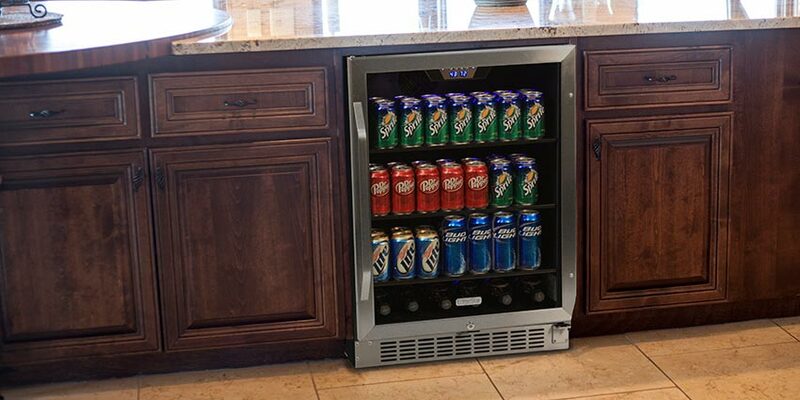 I am looking for an under the counter beer cooler. My wife likes to put her beer in our freezer in order to get it cold enough. But if you forget about it then there is a mess to clean up after it freezes. We have tried beverage coolers that go down to 34F but it is not cold enough. We want the beer to be “just icy”as you open it to drink. I am willing to try a freezer if it will regulate the temperature up high enough. I am guessing it needs to be about 29-33 degrees. But I don’t know for sure. How does Twin Peaks get their beer to 29F without freezing it?